Though AFROPUNK has received its fair share of criticism in the lead up to its inaugural London event, you can’t fault its atmosphere. When it comes to a rich line-up they never fall short, but for the fans it’s about more than just music. AFROPUNK’s a rare festival where everyone in attendance is on the same page and yes – that is because most of the attendees are black. What makes AFROPUNK special is that it respects its audience – from promoting rising local talents like Jorja Smith and Mikel Ameen, to supporting local black businesses by giving them an area to set up shop. AFROPUNK is a celebration of blackness and it was beautiful to see that in action. Here are a collection of AFROPUNK London 2016 performances reviewed by gal-dem. Though Soulection gets plenty of love in London, I have to admit that Goldlink’s talents are pretty much slept on beyond his collaborations with the group. That is entirely our loss since his set was one of the most energetic performances of the day. Playing to an afternoon crowd isn’t easy but he certainly got them going with his easy charm and sweet Virginia drawl. His “future bounce” flow is pretty unique and we’d love to see him in his element at a solo gig soon. One of the most unique British artists on the line-up, Gaika, performed on the slightly smaller i-D stage. After technological difficulties delayed his performance start time, the host revealed prematurely that Kojey Radical would be Gaika’s special guest, told the audience she’d been informed she “couldn’t be political or they’ll shut it down” and ended up resorting to singing a freestyle just to fill time. When Gaika finally appeared on stage, he quickly captured the attention of the crowd, until technical difficulties thwarted his performance again. As Gaika grew visibly irritated on stage, so did the audience. By the time his set was in full swing, his loud, electronic productions seemed too big for the small stage he was performing on. It seemed a shame that he was tucked away in a far corner when he was one of few British artists present that had punk-esque elements to their sound and deserved a crowd that could mirror the energy he brought to the stage. Towards the end of the set, a frustrated Gaika complained that he had been told by organisers to wrap-up, citing the fact that he wasn’t allowed to soundcheck as the reason for the technical delays, before finally bringing on Kojey Radical in a rushed finish to what should have been one of the most exciting acts of the day. 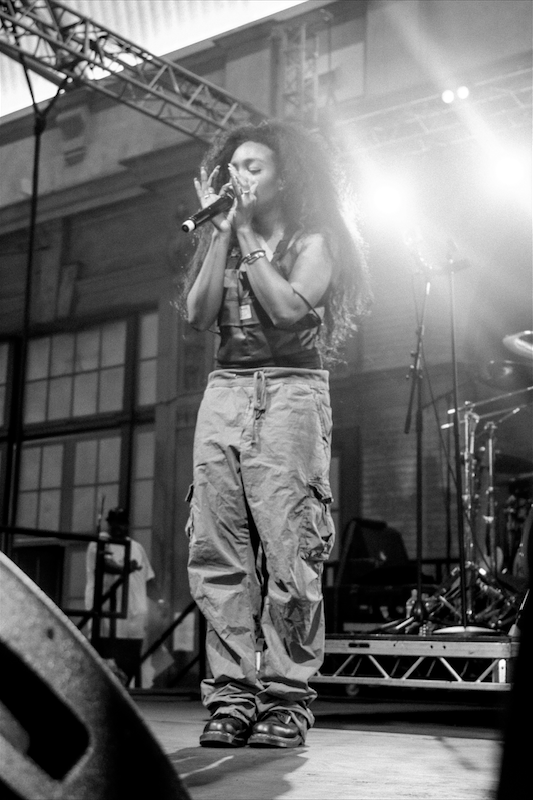 SZA’s debut (and most recent output) was over two years ago so you could sense the anticipation for her return building all day. This kind of disappearing act certainly has it’s perks: just ask Frank Ocean or Solange who have been out of the game for a long while, only to return with stellar records, stronger than ever. In this case it was less of a return to form and more of a reminder of what made us fall in love in the first place. A poorly timed set in a too-small stage with frustrating acoustics made for a bittersweet performance. No one can say that SZA lacks energy or magnetism, but the quiet soft moments of songs like ‘Warm Wins’ or ‘Child’s play’ failed to translate. No doubt these issues would have disappeared in a more intimate setting. 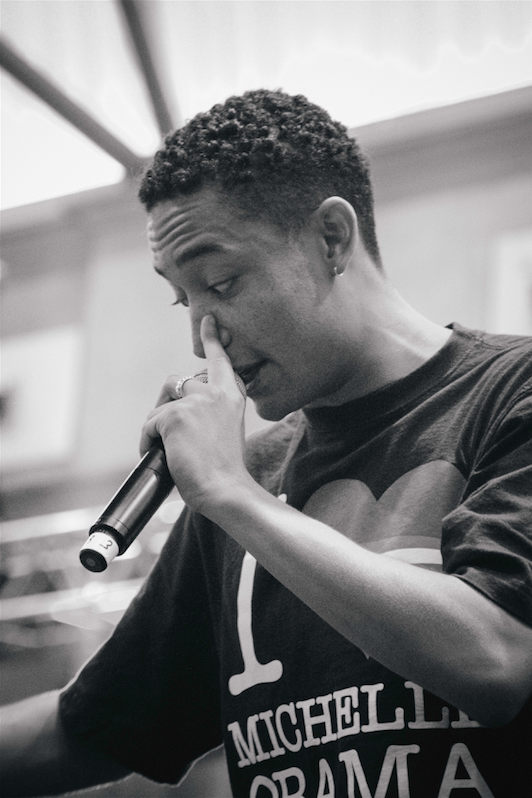 Loyle Carner is an angel that must be protected at all costs. Lady Leshurr and her two incredible dancers had the crowd jumping up and down and chanting along to her sassy, carefree lyrics from the get go. No one was safe from getting dragged by Leshurr, not even the beautiful AFROPUNK audience. When she asked them who had brushed their teeth that morning, the whole crowd raised their hand. Leshurr responded with “I know some of you are definitely lying” before launching into ‘Queen’s Speech 4’. Lady Leshurr was also full of love as she shouted out a member of her family who was in the audience, and thanked AFROPUNK for putting on a much needed event for the black community. It was a fun and energetic set which had everyone singing about their favourite wastemen and wastegyal – “All these girls are really hating…when their lips look like crispy bacon”. As one of the most intriguing rock bands to come out of the UK, fronted by Shingai Shoniwa who has been rocking AFROPUNK looks since before AFROPUNK had even made ripples on this side of the Atlantic, The Noisettes were a brilliant addition to the line up. It was pleasing to see that they opted to shy away from their most well known song, ‘Don’t Upset The Rhythm’, only performing one run of its chorus, and instead focused on performing newer material and older album cuts. Shingai kept it real Zimbabwean, performing their first single ‘Iwe’ to a ululating crowd and changing the lyrics from their closing song ‘Never Forget You’ to “the stripes on Mashinge are hard to change.” Their set was a heavy, vibrant rave of true British-brand blackness. Finishing her set in the throes of the audience, Shingai let a crowd member sing their final song line, and whoever it was, their vocals were equally as on point. Making his third appearance on an AFROPUNK bill, Cakes da Killa managed to deliver the raunchy high energy of his mixtapes to the smallest of the event’s stages. Through no fault of his own, the sound quality made it difficult to hear the tracks being played, despite only standing ten feet away from the MC. Dressed in a teal alligator and bird-printed shirt and matching pumpum shorts, the self proclaimed “Gully C**t” delivered numerous punching lines that had us claiming to read men like palm readers and calling out keeping our “trade in the clutch”. A special shout out to the two dancers, who snatched everyone whilst providing a combination of NY’s ballroom scene, TLC moves circa Creep and classic dancehall whines that amplified the catalogue of black musical cultures many young 20-something black queer kids have grown up with and embraced wholeheartedly. Hyping up his set mid way through, the New Jersey native began spitting, what has grown to be known as, the “power bottom anthem” ‘Goodies’. Rapping along with this live was electric and definitely earned Cakes a fair few new fans and has hopefully ignited the call for UK platforms to reach out and big up the Black queer rap scene on our very own shores. 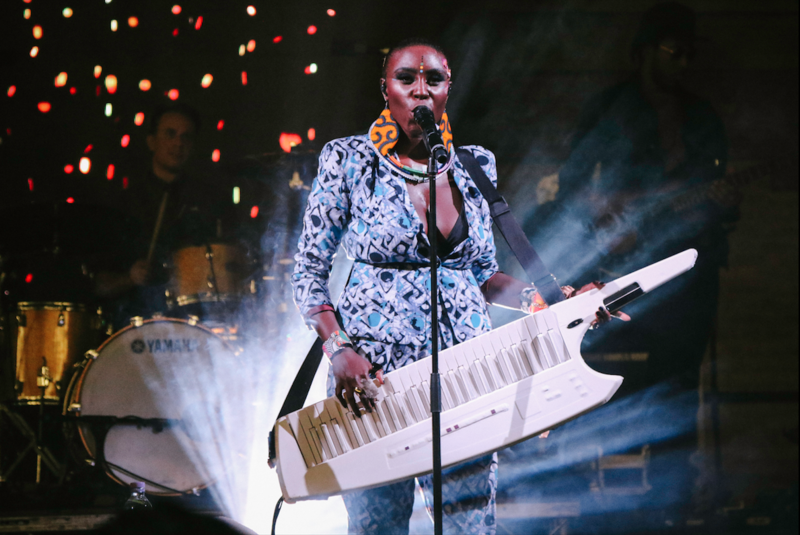 Laura Mvula took to the Soulection stage after performing earlier this year at AFROPUNK Brooklyn. Bringing us humble melodies, a live band and beautiful visuals, Laura gave us old and cherished favourites from her debut album along with some of her new singles from The Dreaming Room. Her ethereal voice and lyrics perfectly taking on love and black womanhood have made Laura a household name in the British music scene and a no-brainer for AFROPUNK London as she so effortlessly encapsulates the black-British-female experience. Her performance was personal as she often stopped to talk us about her manager, Kwame, being like her father and introduced us to her younger brother playing on the cello, or dedicating songs to the first song she would make love to on her wedding night. The crowd all sang and danced as she sung ‘She’ – a dedication to women – delicately displaying her flawless vocals and blissfully tranquil harmonies, before fittingly closing with ‘Phenomenal Woman’ which left the crowd singing and throwing their hands in the air in celebration. She played her all-time hits, wandering off-stage between songs for costume changes, all the while mumbling away to herself on the mic giving us live interludes. “I can’t find my water, it’s so dark… Can I have some water please…”, in a way you would expect your crazy but lovable aunt to talk to herself. Walking back onto the stage along to the anthemic riff of ‘My Jamaican Guy’ sporting a blonde wig in a ponytail and stiletto boots, she threw herself against a fixture on the stage with her leg kicked up in the air and leaning backwards – her deep and rich tones still very much in tact. Ms Jones closed her set hula-hooping for the duration of ‘Slave to the Rhythm’, joined by a male pole dancer – also covered in body paint – whom she playfully spanked. Despite what turned into the M.I.A chronicles when the line-up was first announced, AFROPUNK organisers managed to turn it around. The festival had not sold out, arguably due to the shaky start it got off to upon the line-up announcement but the atmosphere was filled with positive vibes. Some people in attendance seemed to be there to scope out how the festival turned out and by the time Grace Jones took to the main stage, a considerable number of people had already left. AFROPUNK is still in its infancy here in the UK and I guess some people were expecting the same vibe as Brooklyn, which would have only set them up to be somewhat disappointed. We look forward to seeing how the AFROPUNK London brand will grow and adapt.